Handle your retainers with care. Retainers are easy to lose. 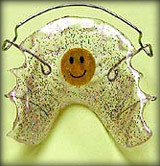 If you take your retainers out, always place them in your retainer case for safety. IN YOUR FACE OR IN YOUR CASE! More information on caring for your retainers.